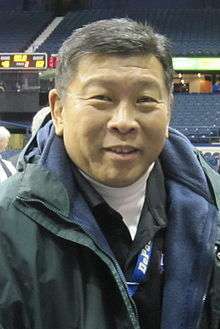 Eugene "Gene" Honda is a popular public address announcer for the Chicago White Sox (starting in 1985, full-time since 1991), Chicago Blackhawks (since 1990), DePaul University basketball, Big Ten Tournament, Illinois Fighting Illini football, and the NCAA Final Four (since 2010). He is also a constant voice on Chicago's PBS station WTTW Channel 11, the Big Ten Network, and the Chicago Marathon. He formerly worked for radio station WLIT, "The Lite" in Chicago. Honda was the PA announcer for the 2009 NHL Winter Classic on January 1 at Wrigley Field. Also, Honda was the PA announcer for the 2012 Frozen Four at the Tampa Bay Times Forum. Honda attended the University of Illinois and is part of the class of 1973. He is a member of Triangle Fraternity. ↑ "City of Chicago: Gene Honda". City of Chicago.org. Retrieved 2010-05-14. ↑ "The Voice: The man behind the mic". USCHO. Retrieved 2012-04-15. ↑ "DigiGuide Library: Gene Honda". Digi Guide.com. Retrieved 2010-05-14.